Grab this eBook now! It is jam-packed with nearly 100 insightful, high impact blog posts covering topics such as starting a freight broker business, freight broker training, freight broker marketing strategies, freight broker tools of the trade, getting your freight broker authority, freight broker financing, plus more. What is the most important ingredient between the broker and carrier? What software, if any, do you need? What are the best tools to help you broker freight? 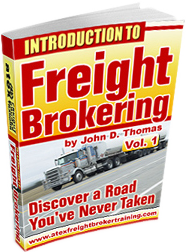 What are the legal requirements to become a freight broker? Freight broker or broker agent – what is the difference?